Mark Hurrie was determined to keep more kids in school. The principal from Somerville, Mass., was tired to seeing so many of his students suspended–so often that his school’s practices were flagged by the state. He was concerned that so many of them were taken out of class and sent to the principal’s office. And he was frustrated by a tense campus environment in which student problems seemed to escalate so quickly. So about five years ago, the principal at John F. Kennedy School launched a multi-faceted effort to change the climate and the approach to working with instances of disruptive behavior at his school. Hurrie encouraged practices meant to build students’ and teachers’ “mindfulness” and their ability to cope with day-to-day problems. His elementary and middle school encouraged the use of maker activity and creativity-focused projects in the classroom. And the school adopted a restorative-justice model, an alternative to zero-tolerance discipline policies that has been picked up by a number of school districts around the country. Hurrie believes those strategies and others have collectively changed the climate in his school. Since 2013, suspensions have fallen from 84 per year to 7 the past two years, he said on a panel here at the SXSWedu conference. The number of referrals–basically, kids getting sent to the principal’s office–for things like insubordination and “endangering behavior”–has dropped a lot, too. The Massachusetts principal was asked to explain his school’s efforts on Tuesday at the SXSWedu event, where efforts to improve students’ well-being and social-emotional health–whether through ed-tech or other means–has been a major theme. The title of that panel was “Making Our Way to Resilience,” which focused on how the traumas that students bring with them to school undermine their learning–and how learning strategies can potentially set them a more positive path. 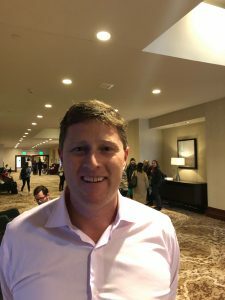 EdWeek Market Brief’s Sean Cavanagh caught up with Hurrie and asked him about his school’s approach, what he’s learned, and what K-12 educators around the country might learn from him. What were the most important aspects of the strategy you put in place in trying to change the environment at your school? The second critical one was going to a maker-mindset approach to learning. How can we get the kids in a constructionist approach to learning that is also related to standards, so that they’re engaged in more of a productive struggle, more critical thinking, real-world problem solving. But what’s the connection you see between the maker-mindset and reducing stress, reducing suspensions? A lot of kids who are facing trauma, they’re kind of spiraling in their thoughts. They have this intense reactivity–anything can set them off. If you get them into [the right kind] of activity, they kind of escape that world, that dysfunction, and focus on their work. It’s like a forest fire approach. You’re clearing the brush. A student comes in, and someone tells them, “Get out your homework.” A student might have really hard reaction to that, which can lead to “Screw you,” and they throw a chair. And so you’re trying to clear all that out–you’re not going to have those [negative] environments. Then where does restorative justice fit in? Anyone who’s worked with a kid in trauma will tell you that anything can set off that kid. It’s how you respond in way to them that’s not in black and white, in a more therapeutic way. And how to you get others to communicate with that child, so they know how their actions will impact the child…and kind of get them back in a learning environment. I imagine that approach would be a real leap for some K-12 administrators. (And restorative justice has critics, who think that it coddles students and ignores effective necessary disciplinary practices). As someone who’s tried it, what are the barriers to it working in other school systems? There was an article [I saw that described it] as an “intervention that works, but an exhausting one.” It’s very difficult because a lot of the time people aren’t ready to bring the child back into the community. Or it’s a big shift from, “This is my classroom, you’re not following what I do, you’re out of here.” It’s a big shift. It does work, but it takes time. You’re kind of looking at the kid as a long-term project, saying, “We’re going to stick with you, we’re going to support you through this process.” But in the background, a lot of these kids are seeing therapists, counselors, to try to [help them]. You talked about a decline in “referrals” at your school – basically, kids getting sent to the office. What’s been the practical impact of that, as well as the drop in suspensions? When you suspend a kid, you’ve got to call the parent, you’ve got to investigate it. It becomes a policy of distraction. When in a lot of cases, you could try waiting 10 minutes, [everyone explains themselves and tries to calm the situation]…It doesn’t always have to be a really elaborate kind of restorative justice. You [reach an agreement with the student and set expectations] and get them back into class, and keep them back in the learning game. You’re fighting for minutes, and it’s about time on learning. What would you tell other K-12 officials about your experience in trying to improve your school’s climate and take a new approach to discipline? It’s really important to make sure everyone in your school understands your values–make that a core principle of your relationship with kids, and the positivity. Make sure you have one or two strategies and provide your teachers with the training and the supports and see it through. Make sure it’s seen in the classrooms, and in the hallway. Every minute should be exuding the value of that relationship. It’s going to take trial and error, but eventually you’ll move not only the emotional needle but the learning needle too. Photo of Mark Hurrie at SXSWedu by Sean Cavanagh.